A classy version of a classic recipe that, with Fluence's unique attributes, makes a first-class choice. Range of voices. Consistent tones and volume roll-off. Fret-King build/playability is excellent. Some will prefer the inconsistency of passive pickups. Think Fishman and the majority of us think of pickups and preamps for our acoustic guitars. 'Fishman-equipped' has become a standard for many major brands' electros, but that's certainly not all that the Boston-based company creates. Now we have a whole new range of pickups for the electric guitar: Fluence. Fishman is distributed in the UK by JHS, the company behind the Trevor Wilkinson-designed Fret-King range, which is the first guitar brand to fit these new pickups onto production models. In concept, both Fishman's and Wilkinson's designs centre on the same re-imagining of the classics. 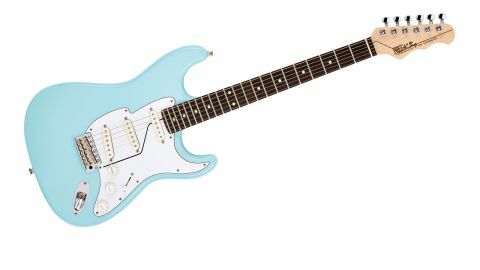 Wilkinson's Corona, for example, takes the Fender Stratocaster, alters a few lines, adds a few tweaks and creates something that's a good guitar in its own right. Fishman, meanwhile has re-imagined the classic Fender single coil. But perhaps 're-imagined', which suggests a facelift or a subtle redesign, isn't going far enough: Fluence represents one of the most significant redesigns of the magnetic pickup in its entire history. "Irrelevant of the technology, these pickups are unique in offering two voices"
Our Corona 60 is fitted with the only set of Single Width Fluence pickups currently offered by Fishman. They might be single-coil sized, but they are hum- cancelling and use two of the solid cores (instead of conventional coils) that lie at the heart of the concept - stacked on top of each other with a spacer between. They also use conventional Alnico IV rod magnets. The three pickups share one preamp, which is mounted to the base of the bridge pickup. Irrelevant of the technology, these pickups are unique in offering two voices. Voice 1, 'vintage single-coil', is described by Fishman as having "vintage tone, clear and present, seamlessly fused with a sweet warmth". Voice 2, selected by pulling up the second tone control, is called 'hot Texas single-coil' and is described by Fishman as "muscular, beefy, 'overwound' tone without losing the highs or the 'Strattiness' we all love". There is a third option, that can be used with either, or both, of the Voice selections - and that is High Frequency (HF) Tilt. It's not wired on our Corona 60, but it effectively offers a preset high-end roll-off and might be handy if you find these Single Width pickups to be too bright. As supplied, with just one pull switch on the master tone, in down position we have Voice 1 of both pickups; pulled up, we get Voice 2 of both. Available with black or white covers (as here), the Single Widths look quite modernist with their protruding staggered height rod magnets, but not overly so. Mounting is via inset, threaded nuts at the end of the bases of the pickups. Moving away from the pickups, the guitar ia eminently fit for purpose. Fret- King's Green Label series sits at the top of the brand's range and the guitars are created in small numbers by Wilkinson and his team in the UK. The specs are very similar to the non-Fluence equipped Corona model with the exception of the hardware, which is from Wilkinson's cost-effective Korean-made range, as opposed to Japanese-made - which might cost less but is typically good. The switch is to ensure that the guitar still hits the market at well below £2,000, despite the cost of the Fluence pickups compared with usual passive pickups. However, it raises a valid point about the Fluence pickups: they're not cheap, and that fact alone may well limit their appeal to the numerous brands that use EMGs, Duncans, DiMarzios and the like. Still, while the Single Widths are nearly twice the price when purchased individually, the gap narrows considerably when sold as a three-unit set with that shared preamp. "The Corona 60 sounds 'produced', as if we've EQ'd it to maximise that 'Stratty' high-end sparkle and tightened up the lower mids"
In Voice 1, the Corona 60 exhibits a clean, bright, pretty balanced Strat-like voice that sounds a little polite; it is very quiet in terms of noise pick-up. There's a marked difference in Voice 2: noticeably higher in output, thicker and more ballsy. We'd be very tempted to either hard-wire this second voice or swap them around so Voice 1 is activated when you pull up that switch. Pulling out a first-generation, and now well-gigged, Fender Road Worn Strat, it sounds bigger, tougher and darker. We also throw another custom-made Strat- alike into the mix, which sits sonically between the Fret-King and the Road Worn. But, of course, we're not just listening to the pickups, are we? There are the different woods, ages and finishes, string gauges, string condition, hardware, and last but not least, the pickups themselves, how they are placed height-wise, and so on and so forth. It's 50 shades of subtlety that can add up to a substantial difference in what we're hearing. After our initial listening test, we restring our three guitars with the same gauge strings and set each of the pickup sets as close as we physically can at the same distance from the strings. It certainly narrows the field a little, but, for example, our Fender Road Worn still has the 'bigger' sound, while the Corona 60 sounds a little more 'produced', as if we've EQ'd it to maximise that 'Stratty' high-end sparkle and tightened up the lower mids. The more we play the Corona 60, however, the more we like it, especially that Voice 2 tone. In anyone's book, it's a good single-coil tone. One deal breaker might well be that volume control. Of our passive guitars, the Road Worn is pretty classic in that as we turn down we lose highs and there's quite a steep hump: we go from full-on to quite a reduction with only a small travel of the pot. The Fluence's volume control is like a fader on a mixing desk: it's very nicely graduated and reduces the volume without tonal change. But, if you want to lose some highs as you turn down, you can't. The tone control could be a little more effective, too: the high-end roll off, especially on the lower bridge pickup tone, takes time before it's noticeable. Our host Fret-King Corona is a seriously good guitar. If you can't find your fit with their obvious competition, we suggest you check it out. But the real innovation here is the Fishman Fluence pickups and the question is, does the world need yet another electric guitar pickup, especially one that bucks the zeitgeist and is active? However, with their potentially three different voices, the Fluences are unique, along with their solid cores that allow incredible consistency from pickup to pickup - something Trevor Wilkinson has observed while building these and other Fret-King Fluence-equipped guitars. It's that consistency, and the other attributes of the active pickup, that make these units very valid for the recording guitarist, or indeed any player who wants to expand the voices on their guitars beyond the usual coil-splits or rarer coil-taps.